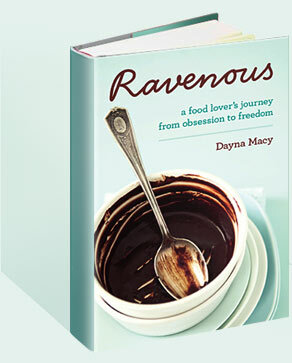 2010 April — Dayna Macy, author of "Ravenous"
“Ravenous” is in my editor Patti Gift’s hands. She will be getting me my ms. back in a few weeks. If I’m going to do any rewriting, now is the time. There are many kinds of memoirists, and many kinds of memoirs. There’s the “It’s Payback Time” memoir; the “Rewriting History” memoir; the “Life is Just Beautiful” memoir; and the ubiquitous, “I’m a Hero” memoir. And then there are those that try to get at something more than just ones own experience in the world, making the book about some bigger truth. I’m trying, a little bit anyway, for the latter. The dead can’t respond to the words you write and the living may hate you for them. I made the decision to give my mother my manuscript to read, so she had the opportunity to respond to anything I wrote about her and my family. I wrote gently about her, and not so gently about my long-dead father. Here’s why: though my mother was not always the mother I wanted, or needed, she did the best she could. My father did not. She called me the other day. She wanted me to change some things I wrote about my father and brother, because it would embarrass her. The line between telling the truth and respecting others is a tough line to parse, one I need to walk with integrity, not only to others, but also to myself. My husband Scott has just launched MediaBugs, a website whose goal is to improve the quality of Bay Area news coverage. Readers who spot an error in a news report that they believe needs to be corrected can file a bug report on the site. Then MediaBugs connects you with the journalist behind the story and the conversation begins — with the goal that the error will get resolved. For more on the project, read Mark Follman’s blog (Scott’s colleague on the project). We had some fine folks over for dinner last week: Stephanie Snyder, a wonderful yoga teacher who is featured in Yoga Journal’s “Yoga for Strength and Toning” DVD, and her husband, Lars Frederiksen of the punk band Rancid. Stephanie and I bonded over our common love of folk music and yoga, and our husbands’ love of punk. I wanted to get Lars and Scott together, so they could discuss punk arcana (Lord knows I can’t), which they did with unabashed joy. “It’s a punk nerd convention” Lars said, laughing, as I served the noodles. Lars told us this great story. He was touring with the great Billy Bragg, who said that his son wanted to get Guitar Hero. I filed “Ravenous” two weeks ago. The next morning, as I was getting ready to board a plane with my family for a vacation in southern California, I bumped into Michael Pollan. “May this be an auspicious sign, Lord,” I thought silently. We got to Newport Beach and while I was working out in the hotel’s exercise room, I noticed a leggy blond working out next to me. And I do mean leggy. I’m reasonably tall, but her legs came up to my pipick. Next to her, was a guy with a shock of blond hair. “I know him,” I thought, trying to place his face. It was Rod Stewart, looking pretty darn fit for an alte cocka. I swam with the boys, read some books by Tamora Pierce, enjoyed an occasional Bloody Mary, trying to rest after the final mad dash to file my book. The subtitle of “Ravenous” is “A Food Lover’s Search for Balance”. I was ready to rename it, “The Big Shlepp”. And now, I’m flailing a little bit. I’ve been, um, consumed by this book for over a year. There will be more work, of course. More editing. I have to re-design my website, create a YouTube video, but moving past the giant act of creating a book from just an idea leaves me a little bereft, a little empty. A weird in-between state. I should be grateful, at least, I reached the finish line — happy, proud, sometimes limping and bitching, but done.